“Inequality hurts us all and goes against God’s vision of life in abundance for every human being”, said Athena Peralta, World Council of Churches (WCC) programme executive for economic and ecological justice, at a prayer service on the occasion of the Week of Action to Fight Inequality, held at the Ecumenical Center in Geneva, on 21 January. The WCC is committed to reducing socio-economic inequalities, which is also one of 17 Sustainable Development Goals proclaimed by the United Nations. “Together with other faith-based organizations”, added Peralta, “we are advocating for national and global financial and economic policies that aim to redistribute wealth and resources more equitably so that everyone – not just a few – can enjoy God’s blessings”, she said. This year, the Week of Action to Fight Inequality (18-25 January 2019) coincides with the Week of Prayer for Christian Unity (WoPCU) which has as its theme for 2019, “justice and only justice you shall pursue” (Deuteronomy 16, 18-20). 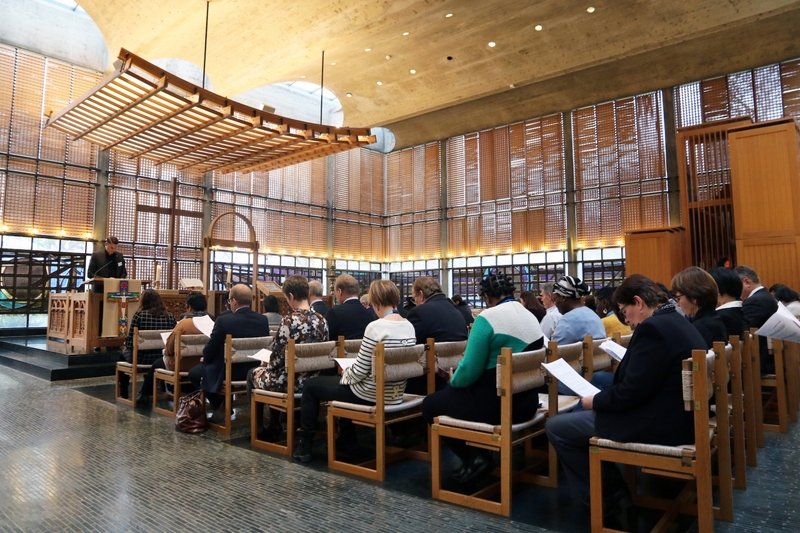 At the prayer service, Dr Ani Ghazaryan Drissi, programme executive of the WCC’s Faith and Order Commission, took inspiration on the theme of justice to reflect on the WoPCU theme for this year, which was prepared by churches in Indonesia, a context strongly marked by inequalities. “Christian communities in such an environment become newly aware of their unity as they join in a common concern and a common response to an unjust reality”, said Drissi. “Only by heeding Jesus’s prayer ‘that they all may be one’ can we witness to living unity in diversity. It is through our unity in Christ that we will be able to combat injustice, inequality and serve the needs of its victims”, she added. The Fight Inequality Alliance is a growing group of leading international and national non-profit organizations, human rights campaigners, women’s rights groups, environmental groups, faith-based organizations, trade unions, social movements and other civil society organizations that have come together to fight the growing crisis of inequality.